Beautiful handmade open style wooden temple made from fine quality Teak wood. It has intricate carving done by our skilled artisans. The temple is mounted on round circular piers and above there is carved area with drawer for placing puja essentials like incense sticks, rosewater, matchsticks etc. There is also a pull out tray for puja thali. The base area has beautiful floral and leaf carving and it gives very fine look to the temple. Above that there is main place for the deity where there are beautiful pillars carved along with railing at the sides of the temple. Rising to the roof of the temple there are Peacock, Om in th middle top & Elephant en-carve at both the sides of the roof of the temple. At the top of the roof there is area with finials at the corner of the roof. The temple is best suitable for home, apartment or offices. Created for a long-lasting use, this temple with a high quality polished coating is ideal for daily worships. 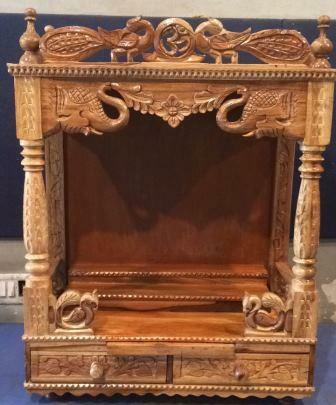 Buy Handmade Intricately Carved Open Style Wooden Temple for Home - 24", sold & shipped by Little India where you can shop online for Traditional Indian Gifts, Handicraft, Decor, Mandir & Murti. 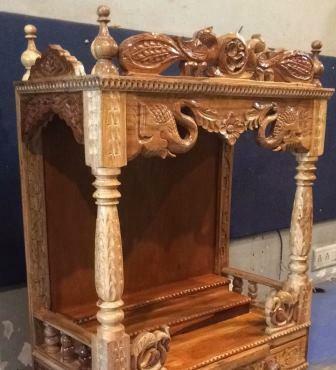 This Wooden Mandir collection has been tagged as Wooden Temple, Woode Indian Handicraft, Traditional Pooja Ghar, Mandir, Carving, Puja, Pooja Festival, Culture, Religious Item,wedding Housewarming Gift, Hindu Religion. Hi, are the 2 steps in the mandir detachable? Does this have 2 drawer in the front or one? & in same design temple 18" temple is 1 drawer. Please send me measurements for this product. Thanks for reaching out. The description has the measurement of the mandir.